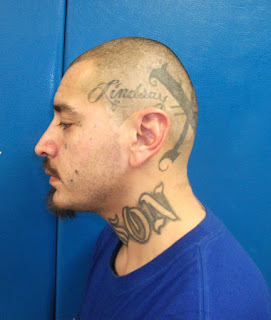 Lincoln, Calif. - The Lincoln Police Department is seeking the location of a man with three outstanding arrest warrants and as a suspect in the theft of tools. The suspect, Marco Gutierrez (pictured above), 29 was seen on the early morning hours of Monday, May 22 an alert citizen saw a suspect running near Hoitt Avenue and 12th Street carrying some tools. The tools are believed to have been stolen from a work vehicle. Responding officers arrived were unable to locate the suspect. Later another citizen reported finding some tools on their lawn. Officers identified Gutierrez as the burglary suspect and learned that he had three active warrants totaling $50,000. Monday evening he was seen near a residence he is known to frequent and he fled from officers. If you have any information, contact the Lincoln Police Department at (916) 645-4040.